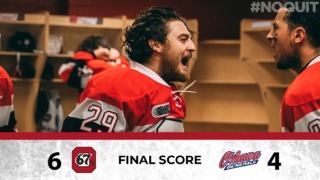 It was no ordinary day at The Office for the 67’s on Friday night as the Barber Poles donned Dunder Mifflin duds and dominated the visiting Peterborough Petes in a 4-0 win. Playing in front of 5,517 fans on the first-ever theme night inspired by the popular sitcom, goalie Mike DiPietro turned away 15 shots for his first shutout as a 67 while his team provided plenty of offensive support in front of him. DiPietro’s shutout was the 17th of his career, a new OHL record. After a scoreless first period that saw Ottawa outsht the Petes 11-4, Nikita Okhotyuk notched his first of the year to give the home team a deserved lead. A pair of rookies extended the gap to 3-0 with Marco Rossi and Jack Quinn finding the back of the net in the second period. Saving the best for last, Tye Felhaber scored a beauty in the third period, as the powerhouse overager toe-dragged in tight before firing a shot home for his league-leading 47th of the year. 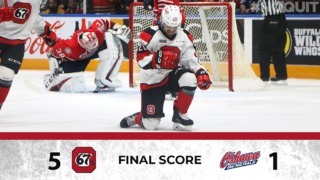 The 67’s return to action Saturday afternoon when the host the Hamilton Bulldogs at TD Place at 2 p.m.
Mikey DiPietro’s shutout was his 17th career OHL shutout, which makes him the record holder for most shutouts in an OHL career. The previous record-holder was Thomas McCollum, who played for the Guelph Storm and Brampton Battalion between 2006-2009. He currently plays for AHL’s Milwaukee Admirals. This chippy game had a combined total of 40 penalty minutes. Tye Felhaber was all over the ice, finishing the game with a goal, an assist and a total of five shots on net. With 2 assists, Noel Hoefenmayer now has 15 points in his last 10 games. 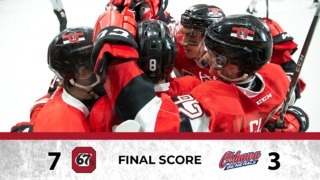 Ottawa remains atop the OHL standings with 66 points.